The 2017 Buick Enclave isn’t a flashy luxury SUV, but it is still an excellent choice for individuals looking for an 8-passenger SUV with plenty of space for cargo and family members alike. While it is clearly descended from the original 2008 model, Buick has kept up to date with other SUV models, although the Enclave is missing some of the more cutting-edge safety features found on other 2017 SUV models. The 2017 Buick Enclave is provided with roomy and comfortable seating at all trim levels. The basic, 7-passenger seating comes in three rows and all of the seats can easily accommodate adult occupants. Optional bench seating in the second row increases the vehicle’s occupancy to eight. This spacious cabin setting is one thing that sets the Enclave apart from many other midsize SUVs on the market. The third row is comfortable and open, with second row seats that slide forward for easy third row access. This makes it one of the few SUVs with a third row that can be considered a comfortable option for adult passengers. The 2017 Enclave has seen few major changes since 2008. For 2017, the primary change has been the new Sport Touring trim level. This addition is primarily cosmetic in nature, adding a new grille design and 20-inch chrome wheels to the basic Enclave. The Enclave’s interior is a stylish setting that is also focused on making the vehicle’s interior accessible and comfortable for the driver and passenger alike. The standard version comes with 7 passenger seating and an 8 passenger setup is available at higher trim levels. Tri-zone climate control, power-adjusted front seats and a central 6.5 touch screen provides a comfortable driving and entertainment experience for the occupants, while a built-in Wi-FI hotspot keeps everyone connected with the outside world. Finally, the it has a large amount of cargo space. With all seating rows occupied, the Enclave still has 23.3 cubic feet of available space. By folding the third-row bench down, the available space expands to 68.9 cubic feet and with both the second and third row folded down, the Enclave gains 115.2 cubic feet of cargo space. This makes the 2017 Enclave ideal for owners who expect to be transporting a large amount of material, whether it is groceries or camping equipment. The Enclave focuses on providing a comfortable ride for its passengers, with firm steering and handling characteristics making the SUV at home on city streets and mountain roads alike. The all-wheel-drive (AWD) option makes the Enclave’s handling even better when confronting rough rural roads or inclement weather. It has a 3.6-liter V6 engine coupled with a six-speed automatic transmission across all of its trim levels. This engine generates 288 hp, providing a smooth ride, although it lacks power compared to some other comparable SUVs on the market. One area where the Enclave lags is in its fuel efficiency, with fueleconomy.gov showing that the SUV is limited to 15/22 mpg for city/highway mileage. Especially in comparison to other 2017 model SUVs, this is a lackluster level of fuel economy. Finally, although the Enclave is rated to tow up to 4,500 pounds with the Experience Buick package, its engine may struggle to provide the best performance when towing or carrying heavy loads. In addition, other SUVs in the Enclave’s class, such as the Chevy Traverse, are able to tow up to 5,200 pounds. This may be a factor for potential buyers who expect to use their SUV to tow heavy loads. 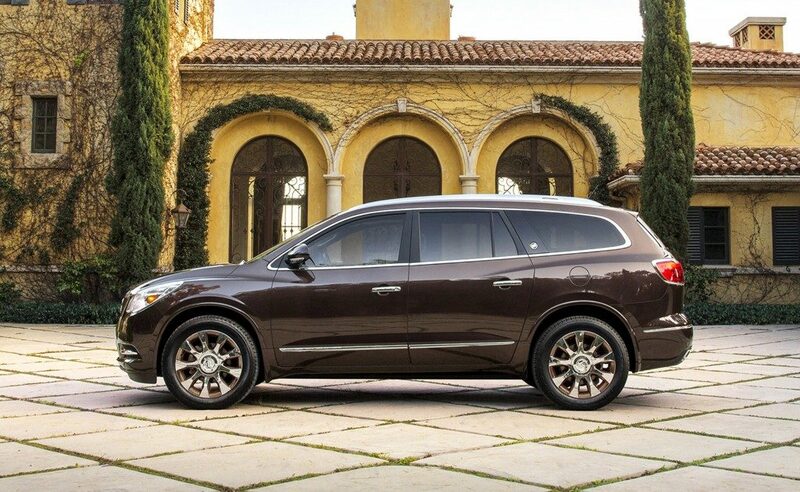 The Buick Enclave isn’t designed to be flashy or stand out as a performance-centered SUV. Rather, what it claims to do, and does very well, is to provide a comfortable, steady and driver-friendly ride. Drivers will find that the Enclave provides a stable driving experience across all types of road and weather conditions. If it may be a little sluggish when towing a heavy load, the Enclave’s performance is still quite acceptable for city and highway driving alike. It may not have the newest and flashiest innovations when it comes to driving safety, but it is still a very highly rated vehicle. The National Highway Traffic Safety Administration has rated the 2017 Enclave at five stars for overall crash safety. Active safety features include headlights that activate automatically in low-light conditions, while a rearview camera provides excellent visibility for the driver. Available safety equipment includes forward collision warning, rear cross traffic alerts and blind spot monitoring. Additionally, articulating headlamps can provide effective illumination when cornering in order to avoid objects or pedestrians. The 2017 Buick Enclave is moderately priced compared to competing SUVs, with three available trim levels. The Enclave Convenience group comes with all standard features, retailing for $39,065, while the Enclave Leather Group upgrades the front seats with heated seating and power adjustments for the passenger seating. Added driving aids include blind spot monitoring and rear cross traffic alert systems. Finally, AWD can be added for $2,000. The Premium trim adds further active safety measures, including lane departure warning and tailgating warning systems. In addition, the SUV is provided with cooled front seats, power-folding mirrors, a 10-speaker audio system, and articulating headlights. As with the Enclave Leather Group, AWD can be added for $2,000. Finally, Buick offers two packages that can enhance any offered trim level. The Tuscan and Sport Touring Editions add $795 to the SUV’s price while adding 20-inch tires, decorative grill and wheel finishes. The Experience Buick adds a moonroof and increases the towing capacity to 4,500 pounds, for an added $2,000. The Enclave is an example of an SUV that has remained true to its roots. Buick chose a design style that has spacious room for passengers and cargo, an appealing driving style and a stylish interior and exterior design. Coupled with its competitive price, this SUV is an excellent investment. Thinking of buying a Buick Enclave? Already own one? Leave a comment and let us know what you think!